I got my nandx/jtag installed. But while reading the nand, it was okay at first, then started getting errors reading blocks. It's still currently doing the first read, not sure how long it will take. I'm going to do 3 reads of it and compare, but I can't seem to find any answers on this. Is it possible something isn't connected good? Yes, every possibility that it's not connected right. Can you post a hi rez picture of your install. Reading the NAND should only take a couple of minutes. A lot of NAND will give you errors, nothing to worry about but if it didn't give you errors at first and now does, it'll probably be your soldering. I don't have a good camera handy, my cell phone pics aren't that good. I'm okay reading till about block 256 or there abouts, then read errors on most, but not all the blocks after it. going to let it run out 3 dumps so i can see if it's possible the read errors are all the same. I could care less if I can't use the internal memory for saving stuff, so if the first part seems good, isn't that all I need? Get the 3 dumps like you say, then compare them. If the errors are all the same then you can just remap them when you create your images. I'll post the result when it finishes. I'll even try to get some good pics of my soldering tomorrow probably. Ya, it's apparent it's my soldering, last night, after it finished 1 reading (like 40 mins), then I couldn't find the flash controller anymore. Trying to get a hold of my friend to borrow his camera, but meanwhile i'm going to check my soldering. Probably should of left the jtag stuff off till i read the nand. I am pretty much a noob solderer. I've done crap in the past, i'm okay at it. I did flux the holes before I did them. Thinking one of them isn't connected good, cold solder, or whatever it's called. like it was barely connected, but as it got used, the heat or something made the connections pull from each other, or something like that. Pics aren't that good, i'm sorry. G1 phone. I fixed my solder, got it reading halfway thru the nand before read errors again. got looking at my solder work, see a part that probably could be fixed, but my soldering iron died, so I have to wait till the 1st to get me a new tip for my weller and/or a new iron to use with it. That seems like some pretty nice soldering...Especially for a noob solderer. Anyways, the soldering seems fine. Just make sure that the solder on the QSBs is also in contact the MB. Because sometimes it happens that the solder gets sticked to the QSB but isn't touching the MB. Check all of the points since even one can cause you problems. Plus, I think the soldering on this point seems to be a little suspicious. Check it, and if possible, resolder the point. Hi i did a jasper 512 and got 20 read errors some at the beginning and some at the end. They're not a problem when reading unless they're in a certian place on the nand. Check them against each other with nandcompare and you should get 0 mismatches if they're good reads. I got read errors 210 and 250. Let me know the errors you got. I read and asked questions about this for a week if not more before i wrote xell to my nand. I learnt loads and thank everyone for the help I got off here. No, the errors were in different place. 1st try: didn't see it. Then soldering iron went cold, got a new one, going to fix it tonight. And thanks for the compliment on the soldering, I am a noob at it, but I read, practiced, and was sure i could do it before I tried. I've soldered wires & adaptors for various computer stuff I have, but I've never done anything as tight as this. And it's really fun actually. I am very much enjoying doing this. I'm most likely fixing it tonight, will let you know how it goes. Once again, thanks for all the replies and help, I appreciate it. well, I screwed up. seemed to have applied too much heat to 2 parts of the quick solder board, can't get solder to stick on it anymore. I'll try to get some pics tomorrow. Going to removed them, and either put the pin headers in, or at least, do the couple wires part. got me a solder vacuum pump for it. Thought i was doing pretty good, but goes to show. =) Wonder what it would cost to get a pro to put in the pin headers. I'm sure i can do them, but still, I thought i could do the quick solder boards also. If I don't solder the pin headers on, and just do the wires, do I need to unsolder them after I do the nand reads & dump of the xell? If I do, then I'll just wait till I get some pin headers to install. Well...It's upto your personal preference. There is enough space to leave them connected there and still install the Xbox casing back together. Otherwise, you can desolder them if you want to. K, cool. I ended up doing the pin headers anyways, since they came with the kit. Completely easy. I got 1 good read, with like 8 errors. but the next read, I started getting errors about half way thru. I think my problem is in the pics, I want to know what my options are for fixing it. It pretty obvious which one it is, just i'm not sure what to do about it. 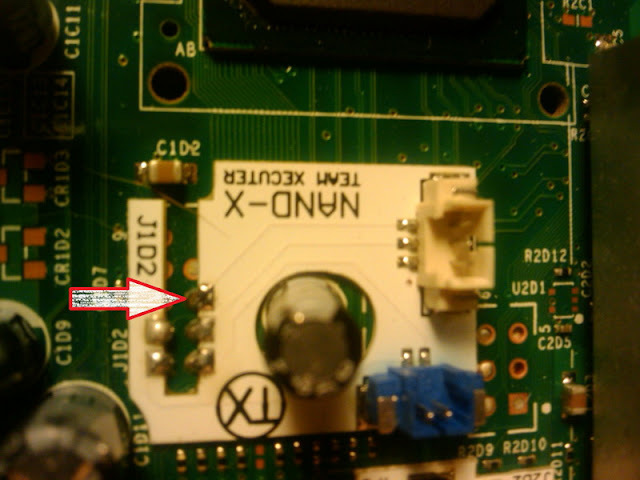 I saw the thread about alt jtag loctions on the board, wondering if I need to do a small wire or something? thanks again for the help, I appreciate it and try not to be too much of a noob. question though about you saying the jtag bad soldering won't get me read errors from my nand. I was pretty sure I did the pin headers up correctly, they weren't really that hard. Guess maybe i need to recheck everything then. These are some pics of my pin headers underside. I concentrated on the ones that were connected, just did a quick solder job to hold the non connected in place. 2 pins holes that weren't used I couldn't clear out. but I didn't worry about them. thanks for your posts and any suggestions you have on why I'm getting read errors on my nandx would be greatly appreciated.